About Capella Recording Studio: Capella Recording Studio Opened in 2006 and has been providing great sound quality recordings & rehearsal space service's for years. This company was started by Anthony Ratliff, is a musician with 20 years of experience in the music & audio recording. Other companies may offer similar services, but our services are the best, and come with a personal touch. We are family-owned and operated right here in DC Metro Are. Since our company opened in 2006, we've treated every customer like they were a part of our family. Other companies may offer similar services, but our services are the best, and come with a personal touch. Committed to helping our customers achieve their dreams. Our Studio is state-of-the-art. With plenty of room, a large recording booth area & comfortable lounge area and more you'll be right at home during your recording process at our Capella Recording Studios. When you first visit Capella Recording Studio one of the first things you'll notice is our friendly team who is very knowledgeable when it comes to recording, mixing, engineering, and producing. If you have questions we'll be able to answer them. One enticing element to our Capella Recording Studio is the space that we have. You'll never feel cramped or crowded at Capella which allows for more creativity and self expression into your music. Our intimate studio space welcomes you and our world class equipment is another incentive. So, come work with some of the best producers and engineers in the DC Metro area. 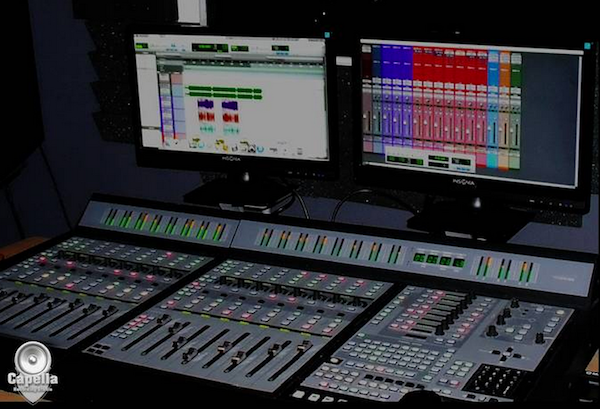 Whether your recording live, adding vocals, tracking, doing voice overs, mixing, mastering, trust us to make it happen. Hourly Rates, Rehearsal Space & Block Studio Times Available!